The Tooth Fairy is a FLAKE and I don't think we will ever be friends! Santa and I - we're tight. The Easter Bunny and I - we get along just fine. The Tooth Fairy and I - not happening. 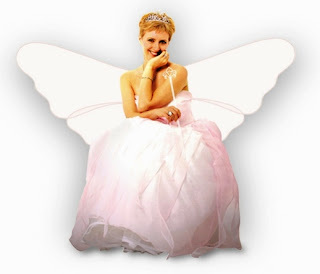 Yes, I have a big problem with the Tooth Fairy. She just really rubs me the wrong way and I will tell you why. Apparently she is a zillion years old, but she never ages – doesn’t even look like a half a zillion years old – and she doesn't share any of her secrets! How selfish is that? How easy would it be for her to swoop just over one room and sprinkle some magic dust to make me younger and beautiful? I have a sneaking suspicion that she sits around and reads, watches TV, or hangs out with friends when she should be at work some nights! Always putting herself first! If she were a really awesome fairy she would share the wealth and use the magic to straighten the permanent teeth when she takes the baby teeth! Think about it- all baby teeth are so straight and perfect. When the permanent teeth come in they can be all over the place! Who is there before the permanent teeth come in? EXACTLY! I smell a conspiracy here. Maybe she is really working for the orthodontists!! I have heard so many excuses about why she didn't show up when she was supposed to that I think it is part of her job to come up with excuses! She doesn't take the time to get the cash she needs to leave under the pillow! What is with that? I know this because there are times my children have gotten way too much money for their tooth and I suspect it is because the Tooth Fairy didn't have change that day! According to the news, friends, and facebook, the Tooth Fairy is far from consistent in the gifts she leaves behind for a tooth! Sometimes she leaves glitter covered coins with notes and sometimes she leaves $5 bills! Not cool to play favorites. Not cool. I don't see how she really can get on my good side at this point. At any rate, I believe she is a flake and I don't think we will ever be friends - sorry Tooth Fairy. First Exercise Class...oh the Horror! Truck Driver - you made my day! !